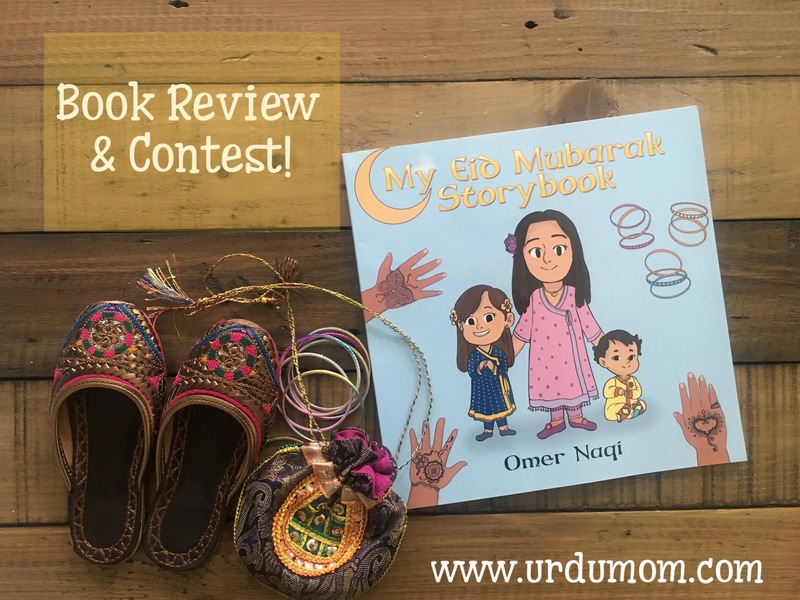 Book Review and Contest: My Eid Mubarak Storybook! My Eid Mubarak Storybook by Omer Naqi is an amazing example of books for children that I want to see more of! The book is a lovely discussion about the Muslim festival of Eid from the unique perspective of children through engaging short stories. I’m excited to review this book and share a contest where you can win free copies of this must-have book. So keep reading! Eid is a festival celebrated by Muslims around the world. My Eid Mubarak Storybook shares the stories of children from many families celebrating and anticipating the arrival of Eid. Each story covers a unique aspect of the festival such as dressing up in your best clothes, learning how to greet on Eid by saying “Eid Mubarak”, the tradition of giving three hugs, cooking Eid treats, importance of charity and sharing our good fortune with others, visiting family and friends, sighting the Eid Moon, putting on Henna etc. Each story provides many opportunities to engage the children in the story, ask questions and discuss the main theme. My children are aged 6 and 2 and both found the book extremely interesting. I felt I could customize the book according to their respective ages by discussing the importance of sharing and charity with my daughter (age 6), while doing the hugs count down with my son (age 2) and practicing saying “Bismillah” and “Eid Mubarak”. Children from age 2 to 12 would find this book interesting and best suited to their curious needs. The book is written in English covering Muslim traditions from around the world. However it does not go into deep details, leaving room for every family to customize according to their unique traditions. The book has equal representation of male and female characters and there are children from various age groups and family compositions. It would be easy for children to relate to the book as they hear familiar names in Muslim families such as Emaan, Qasim, Aaminah, Ibrahim etc. The illustrations beautifully show the multicultural representation of Eid around the world. My Eid Mubarak Storybook would be a beautiful edition to any Muslim child’s book collection or any one who is curious to learn about Eid. This is also an ideal book to read to a group of children if you have been invited to talk about Eid at your child’s school. Since this is such an amazing book, I’m super excited to share a contest to win 4 copies of this book! We are giving away one physical copy of Omer Naqi’s book “My Eid Mubarak Story” (shipped anywhere in the world!) and 3 E-books to be downloaded for free! Do the following actions to get an entry. Increase your chances by doing them all! The winners will be chosen via a random draw of all the entries and announced on June 12, 2017 (just in time for Eid). Update: The winners have been announced and you can read all about them here. You can buy the book from the Liberty Books store in Lahore or Karachi or ask them to deliver anywhere in Pakistan! Follow this link to order the paperback for My Eid Mubarak Storybook. Follow this link to get the paperback and ebook in Canada. Disclaimer: This post is sponsored by Omer Naqi, however the opinion is entirely my own! This looks fantastic! Can’t wait to read it! It sure is! Hope Lyla wins! Yes, a very interesting one! Hope you guys win! This sounds very interesting and something my almost 5 y.o. would for me to read to her. There is a shortage of books on Eid and other Islamic books for kids so this is a nice addition. Thanks for always sharing with your followers. I agree, this is a great addition to books on Eid! Hope you guys win! All the best!! stay in touch! This looks like a lovely book! Excited!!! It sure is a lovely book! We have been reading it at bedtime since we got it. It’s a great book for young children to start an age-appropriate conversation about Eid! Hope you guys win! From your review seems like a very good read esp for children living in countries like America where we need to do extra efforts to get our children involve in Islamic traditions. Yes it’s a lovely book. I agree with you, that we have to do an extra effort living in North America. What I love about this book is that it leaves lots of room for discussion with the kids and engages them in the story telling. Good Review…always looking for such stories to read to my daughter! Thanks for sharing. This is an absolutely amazing topic to discuss with kids. Considering eid is a festive occasion, this book will be an amazing gift for any child. Thanks so much for participating! all the best!!! Yes it sure is! Lots of opportunities to engage the kids and chat with them! It’s great for the ages of your children for sure! Thanks, for commenting! Really good idea for a book. Every time I visit your blog I feel so proud of you 🙂 keep it up !! Thanks buddy! Love you lots! Thanks for dropping by! so true! This book has lovely simple stories and lessons! Best of luck! Hope you guys win! My daughter is desperately looking forward to read this book. She loves stories that she can relate to. Awwww hope you guys win! Yes, these are definitely very relatable stories! It’s a lovely book to give as eidi gifts. Yes for sure! This book would made for a great eidi gift for kids 3 – 10! Looks like a wonderful eid book. My girls can’t wait to add this book to their collection. It sure is! Hope you guys win the competition! Walaikum Salam! Thanks Tania, for your feedback and appreciation! Let’s keep doing this together! Looks like a really fun book for kids. I really enjoyed the review Z did on story time today. Would love to add this to Sereen’s collection! awww thanks Samia! Yes, I’m sure Sereen would love it! Looks like a fun book to read. I would like to win this. Thank you for participating! Really hope you and your girls win it! Happy Ramzan! I hope the boys win! Fingers crossed! What a wonderful book. My daughter would love it! Lots of love for your daughter! I’m sure she will! This is a lovely book. Hoping to win it for my girls (Anousha & Aleeza). Lots of love for Anousha and Aleeza! I wish all the children could have won (if I had it my way!). Yes, its an amazing one for their library! My daughter Aina loves to read books.She finds Urdu really diff,but by looking at zainub the way shes communicating with her mom and kids in d show is loveaable.In ur last show,zainub explained the pictures of my Eid Mubarak storybook,how it is like what happens on Eid from choosing dresses,applying mehndi and so on.She wants to watch that part of d show again and again so I would love it if she gets this book as a surprise gift.She has become a regular viewer of Ur programme.Living in Doha,it is hard to find books on such festivals,so would b glad if I get one for my daugher Aina aged six and son Talha aged ten.Secondly can u tell me from where can i buy the book in Doha. Lots of love for your daughter Aina! I’m so happy she is enjoying our Urdu Story time! Tell her we are very excited that she joins us every week! I have connected you both on email 🙂 You’re most welcome!